Clean beach condo with 2 pools & tons of nearby shops/dining/entertainment! 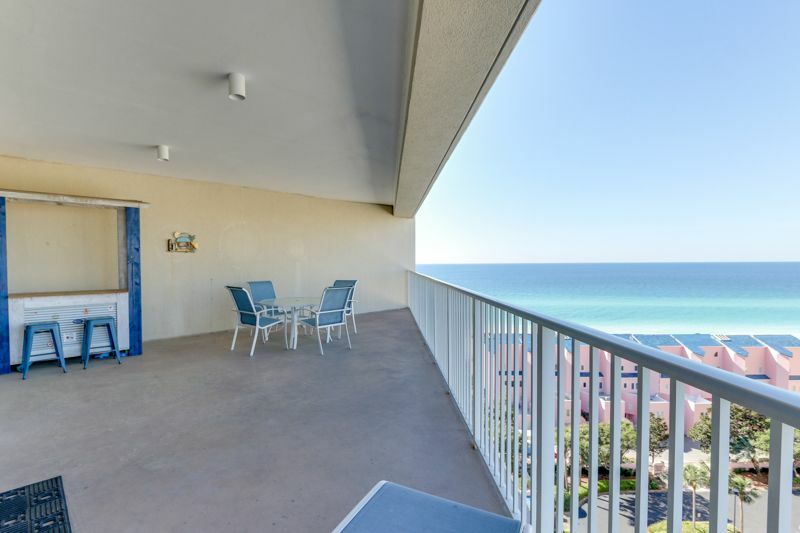 In this 10th floor condo, you can sit in or outside and enjoy fantastic Gulf views from your private, sun-kissed balcony. The master bedroom is a dream come true and has a king-size mattress with a huge, connected master bathroom that includes a jacuzzi tub and walk-in shower - perfect after your long days at the beach. The guest bedroom offers two twin-size beds and is perfect for friends and family, while the queen size sofa- sleeper in the living room can help you accommodate two more guests! Your guest bathroom can be accessed directly from the guest bedroom or by the main hallway by the kitchen/living room. Brand new leather chairs and ottomans have been added for extra seating out in the living room. The modern kitchen has all the comforts of home, which include a dishwasher, coffee maker, blender, toaster,fridge, microwave, etc. so you can enjoy dinner in. A washer and dryer are in the unit for your convenience. Remember: bed and bathroom linens are included in the unit - all you need to bring are beach towels! The experience was great. They are so easy to work with. Gorgeous view of the coast! By far one of my most favorite condos and favorite location! Loved this resort and the daily activities they have for the kids! Poolside bar and grille makes everything even more convenient!! We will be back for sure! Loved this roomy condo! Beautiful view of the coast! Floats , boards , chairs & umbrellas , etc kept in closet for other guest. Appreciate the thoughtfulness ! Only steps away from the beach. Daily activities for children on site next to pool area. Bar & Grille on site was super convenient!! We will be back!! Love Topsl resort !!! 5 stars is so amazing! We are so happy you enjoyed not only our unit but also appreciated not only all the the thought and care we put in, but also all the amazing amenities that we offer. We hope you consider us in the future for any needs you may have, as we can offer a returning guest discount. We love that you loved us! We offer a returning guest discount, to keep in mind should you decide to come back. place was as advertised great view from balcony, pools and beach nice, nice place was clean and quiet only complaint place was for sale and they wanted to show it so we had to leave kind of annoying but other than that i would stay there again. Thanks for such a great review <3 We apologize for the showings, and we try to limit those with guests in house. When renters are there for a month at a time it makes it hard to show the property at a future date. You were absolutely amazing to work with, and hopefully the unit will sell to a new owner so you don't have to worry about those troubles next year. Let us know if we can help find you another beach retreat, and we'll see you next winter! We are happy to have been of assistance with the dishwasher. We appreciate your review and are so glad you enjoyed your stay!